We started talking about worms about a month ago, thinking about adding them to our compost to help it along. Michael did the research and we talked it up with the boys, describing how they are beneficial in the garden. The boys started showing an interest, picking up every worm they found on the driveway and sidewalks and asking questions about how they eat, and Builder Guy borrowed Diary of a Worm from the school library to read to his brothers. We were ready. We ordered our worms from Worms Etc. and received them in just a few days. 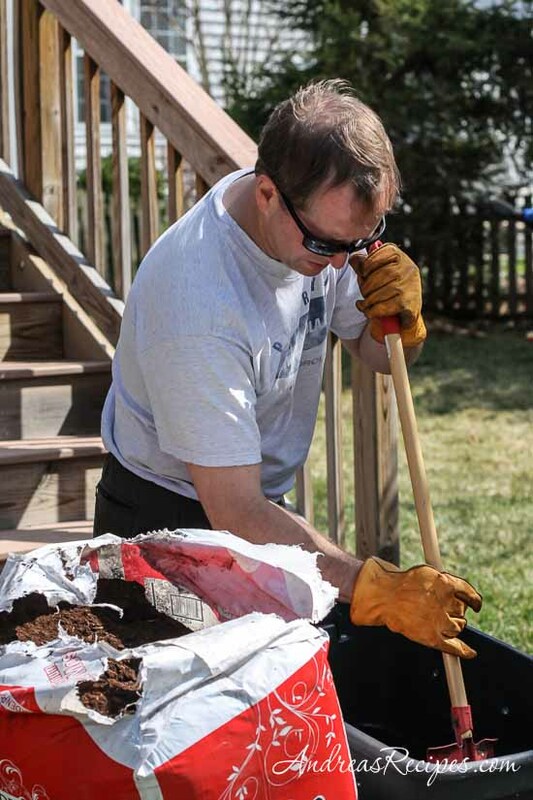 A pound of worms will compost food scraps from two people, so we started with two pounds and will add more as necessary. 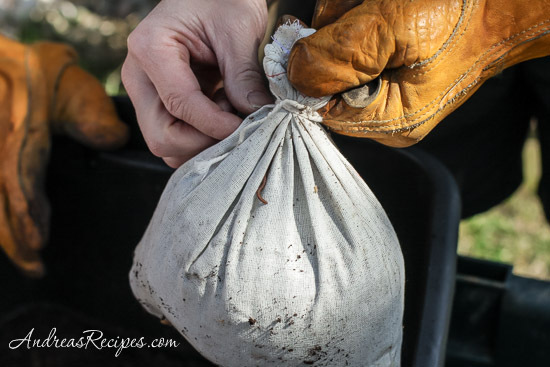 The worms are shipped in a white cotton bag with peat moss inside, and the bag is on a bed of shredded corrugated cardboard, which can be used in the worm farm. 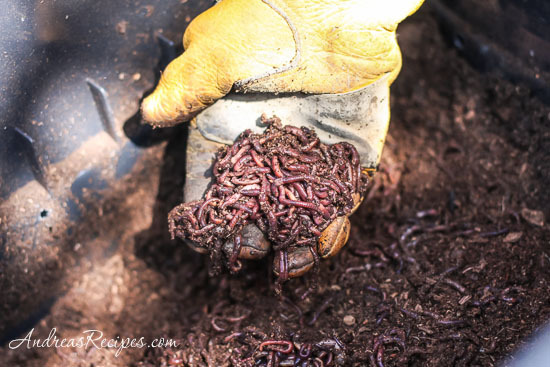 These particular worms are red wigglers, known for their voracious appetites and ability to thrive in compost. Their castings make excellent fertilizer, which will feed our garden well. 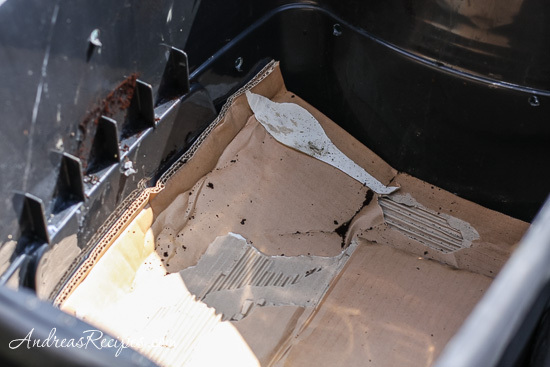 To make our worm farm, Michael bought a black 18-gallon plastic container, drilled a few holes in the sides, and then lined the bottom with pieces of corrugated cardboard. He added about 4 inches of peat moss, moistened it well, and made a bed of shredded corrugated cardboard in one end and crushed eggshells in the other. The shredded cardboard becomes a bed of sorts and the eggshells feed the worms. Once the bed was prepped, he added the worms. The worm farm is safely tucked away under the stairs of our deck, out of direct sunlight. As the worms adjust to their new home, they will eat and propagate, and if fed correctly they’ll double their numbers in about 90 days. As the population grows we’ll transfer some to each compost bin and possibly add another worm bin. Feeding worms properly is important. Just about any kind of kitchen scrap will do, though as with composting we avoid meat and dairy products. We also chop up the scraps and are considering purchasing a cheap blender for really chopping up the scraps, which helps speed the process along, as does drying out and crushing egg shells. And the boys, our sons that we thought would be interested in the worms since they pick up every worm they find on the sidewalk after a good rain? They didn’t want to get within ten feet of all those wriggly worms. I think it may take a while for them to warm up to our newest garden helpers. The kids will warm up to them once you involve them in your first castings harvest. I find that worms don’t really like citrus very much. But they love hiding inside avocado skins. Proper drainage is important, as the worm “tea” can be smelly and unpleasant. Keeping the right balance of airflow is important as well, as you don’t want the food to get soggy and moldy but you also don’t want the worms to dry out. Once I finished building my waist-high container garden, I bought three containers of worms from a local fisherman. They have kept the garden in great condition and propagated like crazy. But, I hadn’t thought about my compost heap. Good idea and something else I have to do with spring cleaning and setting things up. Thanks. Come visit when you can.